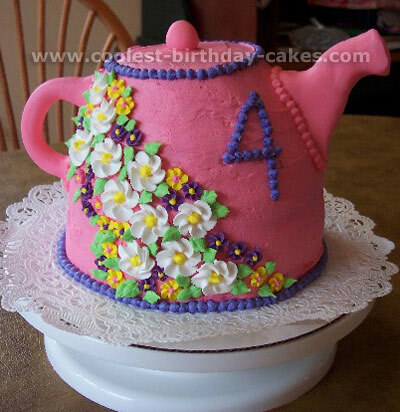 This was a quickly made teapot cake recipe for my daughter’s friend Rylee’s fourth birthday party. I used the doll cake form for the cake and hot glue-gunned Necco wafers together for the handle and spout (okay, so we couldn’t eat that part of the cake, but it looked really cute). I cut gumdrops in half for the decorations and just used a basic buttercream frosting. My daughter and her friends wanted to have a tea party, so I thought this cake recipe would be perfect. I made the pot part of the cake from a round mixing bowl. 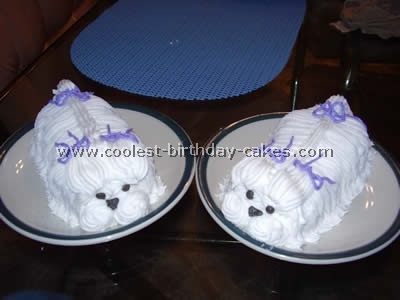 I then put icing all over. I added small M&M’s in a flower shape. Also for the ball on top, I used a round gumball. For the spout and the handle, I just traced a pattern, and cut it out of posterboard, and inserted it into the cake. Simple enough. 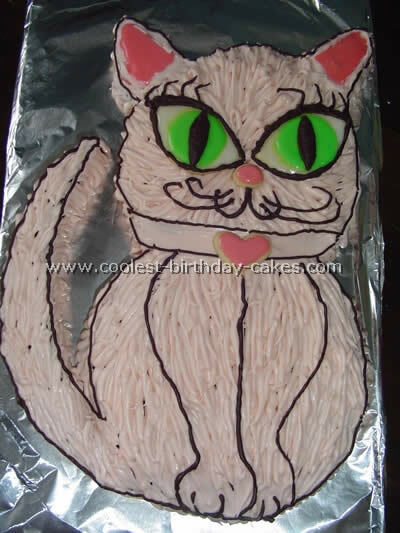 I used this cake recipe for my niece’s birthday. 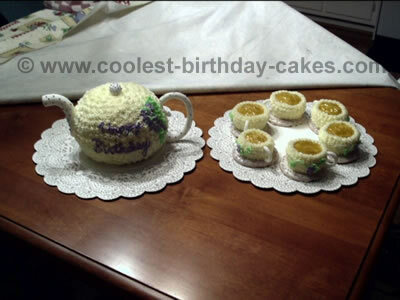 I used two Pyrex bowls to make the tea pot and cupcake pan to make the tea cups. A cake that yields a heavier batter works best. 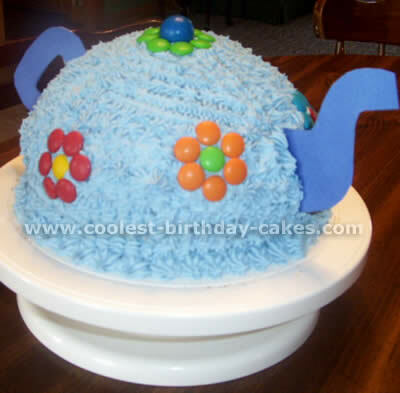 I used buttercream to cover and decorate, as well as fondant for the round handle on the top of the teapot, the spout and handle on the tea pot and handles on the tea cups. I also made in advance flowers from royal icing and attached them using buttercream. 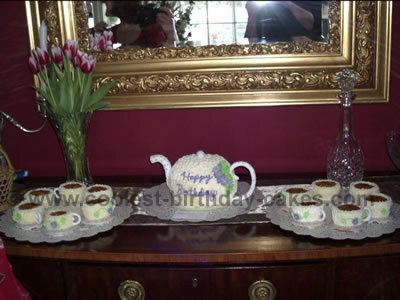 I used clear piping gel tinted brown to resemble the tea in the cups. The children didn’t recognize this as icing and wanted it scraped off. Next time I will use maybe buttercream tinted brown instead. This type of cake recipe can be customized to fit any style of tea set imaginable – use all fondant for a whimsical appearance, or flowers like this one for a dainty appearance. The possibilities are endless. I had a tea party for my daughter’s 5th birthday and used this cake recipe. I used a 2.5 qt bowl for the bottom of the pot and a 6oz bowl for the lid. I baked 2 cakes in 2.5 qt bowls and one in the 6oz bowl. Trim the excess off the top of each bowl cake to make it flat. Place one 2.5 qt cake flat side up and ice the flat part. Then place the second 2.5 qt cake on top, lining up the 2 flat sides. Then place the 6oz cake on top flat side down. Then, using a size 16 star tip ice the entire cake with stars. Using the same tip, edge the top and bottom of the lid. 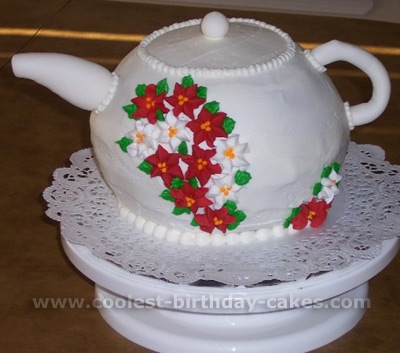 Ice flowers around the teapot then use a straight tip to add vines and write on the cake. I made the handle and the spout using wired ribbon. Just wind the ribbon around a dowel rod and pull out to make the spout. My daughter celebrated her first official birthday (2000 leap year baby) on Feb. 29, 2004. I wanted to have a dress up tea party for nine of her girlfriends. 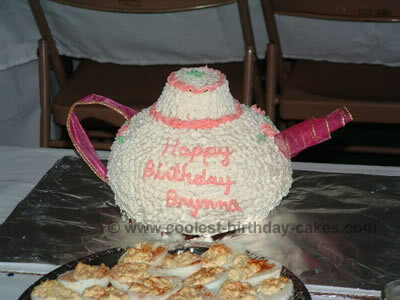 So we created a tea pot for her cake. The party was a hit. We had a make up session, photo sessions, and lots of tea in the form of apple cider of course. This cake was made for my church’s women of faith trip we take every year. A teapot was the theme of the trip. This is a cake recipe that takes some time. The handle and the spout were the hardest part of the cake recipe. I managed to keep them attached to the main part of the cake with toothpicks. 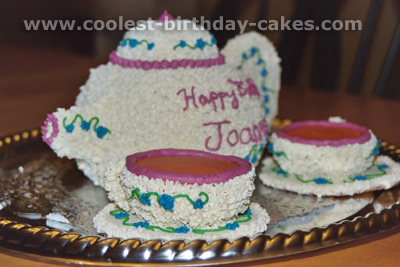 I used this cake recipe for my grandmother for mother’s day she loves tea and tea pots so off I went. Here is the cake recipe: I baked two cakes in round glass baking bowls and made a large cupcake in a pot pie tin so it would mushroom out. I then cut the big top off and saved that for the teapot lid. 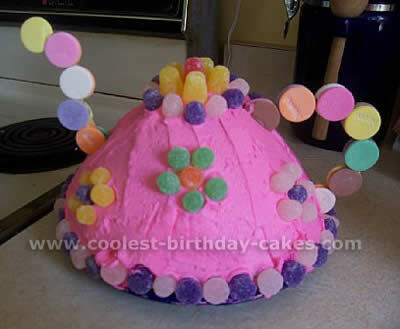 I took the baked bowl shaped cakes and frosted the middle and put them together to form a round shape. I used a cake recipe for the handle and spout and little teapot cover handle that hardened very quickly (I will not use this again- it didn’t turn out pretty good for me. Next time I will make handles and spout out of shaped cookies). 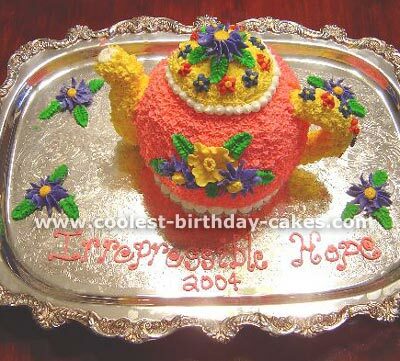 I frosted the whole teapot and lid, then decorated it with flowers and put the handles on. This cake recipe was a hit! My grandmother loved it and cried when she saw it. The flowers would have looked better if I had made my royal icing roses but I ran out of time. 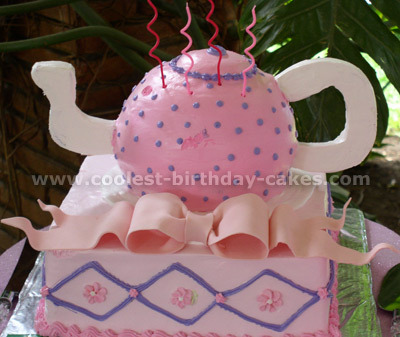 This adorable teapot cake recipe is very easy to make! I baked two cakes: one in my large glass batter bowl, and a second in an 8-inch round pan. 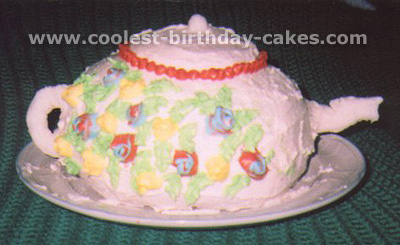 After the cakes were completely cooled, I spread frosting on the 8-inch layer and placed the dome-shaped cake on top. 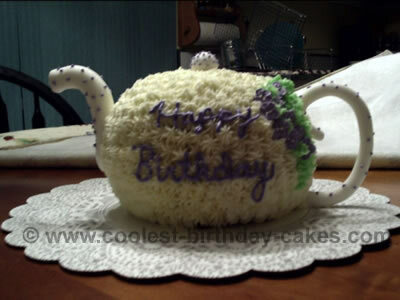 I frosted the cake with homemade frosting and then placed the handle and spout pieces on the teapot. I made those pieces several days prior with store bought fondant, which I colored and formed into the correct shapes. I used thin dowels cut into 5 and 8-inch lengths, which were inserted into the spout and handle before setting them aside to dry. 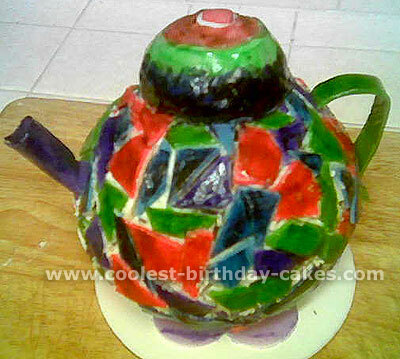 Once the spout and handle are in place, continue to decorate with flowers, swirls, etc. I hope these cake recipe and decorating ideas have helped you. This cake recipe is made from the sport ball pan set. It’s frosted in white butter cream icing. I used rolled fondant to make the Mosaic pieces. 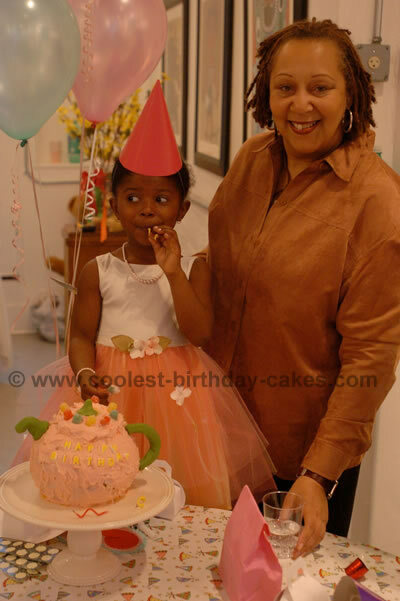 The top of the pot is a small round piece of cake covered in rolled fondant and painted with frosting color. I saw this cake recipe on the Wilton site. This adorable Christmas teapot cake recipe is very easy to make. I baked two cakes in Pyrex glass bowls, trimmed the tops, and stacked them to make the round shape. 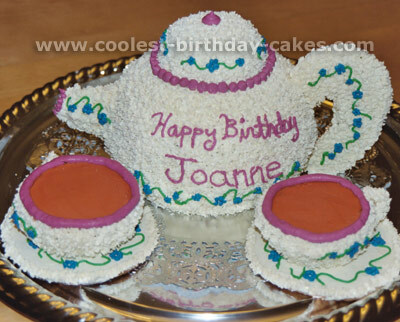 The spout and handle are made with fondant with skewers inserted in them and then into the cake. The flowers are made with royal icing using the 2D tip, and tip 3 dots in the center. Very easy poinsettias! A cute Christmas teapot cake recipe!